GLENWOOD CANYON – Repairing damage done to Interstate 70 by plunging boulders will cost a little more than $860,000 but the total cost of the rockslide is expected to be much more, the Colorado Department of Transportation says. The apparent low-bidder is Flatiron Construction. The total construction cost for the repair project will total $860,417 and Flatiron has committed to completing the project in 55 days. The total cost of the rockslide is expected to be much higher as the construction cost doesn’t include emergency response, blasting and other operations needed to open the highway. These figures are still being totaled. It is estimated that this slide, which closed the freeway for almost four days, brought 20 boulders onto the interstate, ranging in size from 3 feet to 10 feet in diameter. The largest is estimated to weigh about 66 tons. 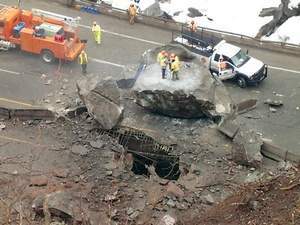 The rocks have made holes in the elevated sections of roadway – the largest being in the westbound lanes (closest to the hillside) and measuring 20 feet by 10 feet. Another hole in the lower eastbound lanes measures 6 feet by 6 feet. There are a half a dozen other holes in the roadway, as well as areas where rocks are embedded. Most of these repair areas appear to be approximately 5 feet by 5 feet. Rocks are scattered over 100 yards of roadway. Also damaged are three sections (about 120 linear feet) of steel guard rail and 100 linear feet of median barrier. The damage is similar to that resulting from the 2004 rockslide. The repairs will most likely take place Monday through Friday, but some weekend work may occur depending on weather and project schedule.